STATEN ISLAND, N.Y. — Sal Vulcano, James “Murr” Murray, Brian “Q” Quinn and Joe Gatto are the “Impractical Jokers” of truTV’s hit series — and soon-to-be big screen movie — about four good-natured anti-wiseguys who challenge each other to side-splittingly awkward, hidden-camera dares and pranks. Even before their first major motion picture was in the can, “The Tenderloins” were rare: Young borough breakout talents you wanted to cheer on — not cringe at, a la MTV’s “True Life: I’m a Staten Island Girl” or a host of other reality TV traumas. And now we get to pay our respects: Staten Island Museum’s new “Impractical Jokers: Homecoming” exhibit opens this week on the grounds of Snug Harbor Cultural Center & Botanical Garden in Livingston. July 12’s exclusive opening night event launches with an outdoor festival at 4 p.m., highlighted by a brief speaking program with the “Jokers” at 6 p.m. to open the doors to the all-ages exhibition. Tickets are $150 or $250 for “premiere seating” at StatenIslandMuseum.org. 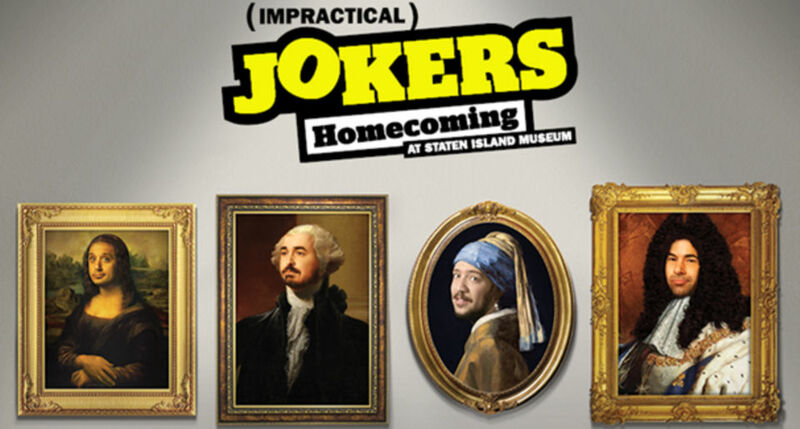 Note: Regular admission to “Impractical Jokers: Homecoming — up through March 17, 2019 — is $8 for adults, $5 for seniors/students; $2 for children 2-12; free for members and kids under 2. Featured artifacts: Original costumes, props and art (we hope to see some Christopher J. Sorrentino pieces in there!) created over the past seven seasons. Plus, new interviews, episode highlights, behind-the-scenes production secrets and interactive surprises.